Boating is a favorite pass-time of many residents and tourists to San Carlos, whether it be for fishing, snorkeling, scuba diving, sight seeing or just enjoying time on the water. Where to Buy your Fishing Licence? 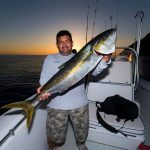 Mexican fishing licences online. And, the OCV (Conventions and Visitors Bureau) sells fishing licences. Cost, more information and location.